In 2015, we celebrated the 75th anniversary of U.S. government sponsored exchange programs. The many accomplishments of U.S. government sponsored and privately funded alumni worldwide are a clear testament to the power of exchanges and your commitment to making our global community a better place. Alumni like you make a real difference in every region of the world. After Nigerian Mandela Washington Fellow Ndifreke Etiowo Andrew-Essien was denied boarding on an Accra flight because she was wheelchair-bound, she successfully advocated for new regulations to ensure airlines in Ghana provide access to all. In Paraguay, a team of alumni shared cutting edge STEM technology with over 18,000 people through the "Techauka-Paraguay" project, using hands-on exhibits to enhance STEM education for rural youth and educators. In Iraq, the first-ever Iraqi alumni association was launched, energizing the country's alumni community of over 6,000 through social media campaigns. 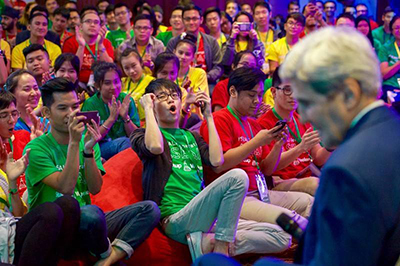 Crowd cheers Secretary Kerry before he addresses Young South East Asian Leadership Entrepreneurial Summit on sidelines of ASEAN Ministerial Meeting in Kuala Lumpur, Malaysia on August 5, 2015. I am pleased to report that in 2015 several alumni became heads of state or won prestigious awards in their fields. Fulbright alumna Kolinda Grabar-Kitarovic was elected as Croatia's first female president, while Humphrey alumnus David Granger became president of Guyana. Fulbright alumnus Mirabbos Hojamberdiev from Uzbekistan received the prestigious 2015 Atta-ur-Rahman Prize for his contributions to the field of inorganic chemistry. I value the important role Exchange alumni play in sharing their perspectives on pressing global issues with President Obama and with other senior U.S. officials including me. During the first Young Southeast Asian Leaders Initiative alumni summit in Malaysia last year, five hundred alumni met with President Obama and discussed deepening regional integration and working across borders to improve education, entrepreneurship, civic engagement, and the environment. Hundreds of U.S. citizen alumni gathered at the Department of State for the first ever International Career Building Seminar. I have met with countless alumni on many of my travels overseas and here in the United States. I am consistently impressed by your talents, enthusiasm, and dedication. All of you demonstrate the lasting impact of international exchange. I look forward to learning more about the new projects and efforts you will carry out in 2016. 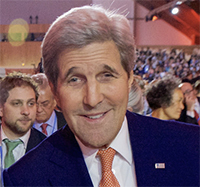 As always, the Department of State is ready to help you in your endeavors. 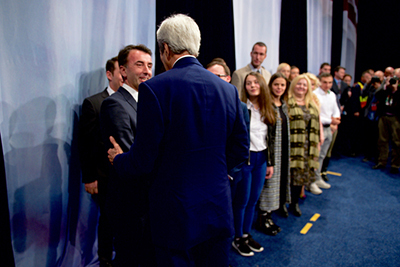 Secretary Kerry shakes hands with International Exchange Alumni in Pristina, Kosovo, on December 2, 2015. Our sixth annual Alumni Engagement Innovation Fund competition kicks off in February, offering grants of up to $25,000 to support alumni-led community service projects. We will debut the Alumni Action Corps, a new volunteer initiative by alumni and for alumni, in the spring. Please stay tuned for our new online talk show and podcast offerings as we continue to expand our slate of virtual programming. You can learn more about these initiatives (and suggest your own ideas) through the International Exchange Alumni website, Facebook, Instagram, Twitter, Tumblr, and our newest platform, Medium. So keep up the excellent work—let's keep showing the world what the international exchange alumni network can do. I wish you all a happy, healthy, and successful 2016.